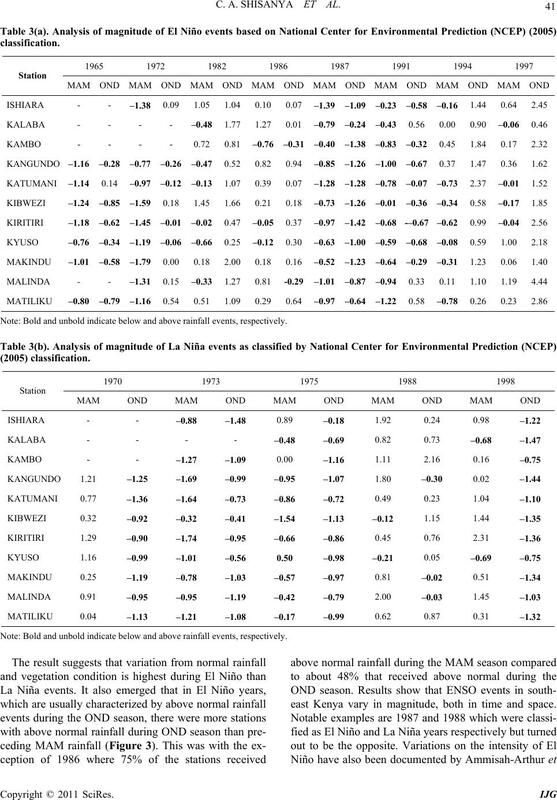 tionship between rainfall and NDVI yield ground for improvement in the prediction of local level rainfall. vulnerability of livelihoods to climate related disasters by improving their management. C. A. SHISANYA ET AL. 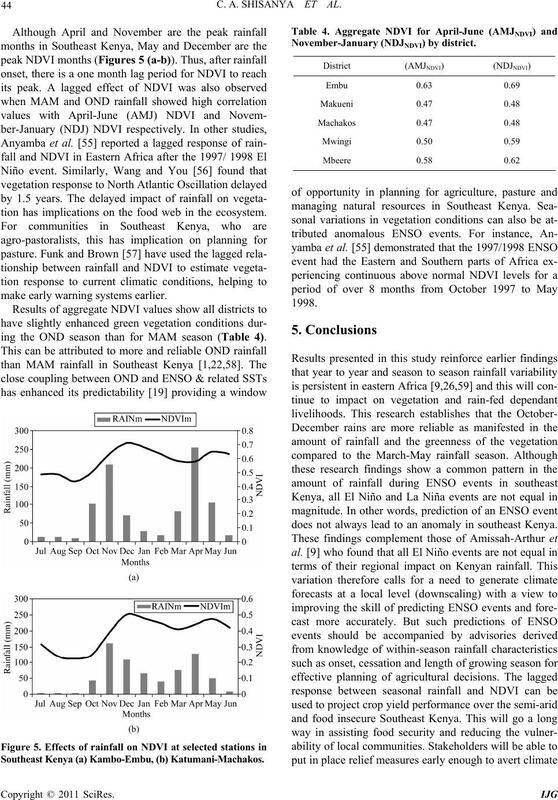 NDVI data sets for semi-arid southeast Kenya (Figure 1). famine and food sho rt a ges during d ro u ght years. Figure 1. A map showing the position of the study area in Kenya, administrative districts and distribution of rainfall stations . and comprises 20% of the total land surface area . the portion of Kenya that encompasses the study area. Table 1. Geographic location (longitude and altitude) of the study stations mean annual long (MAM) and short (OND) rainfall. to 2003 for the 11 stations used in the study (Table 1). nel 1 and high reflectance in Channel 2, respectively. NDVI values that are near zero or slightly negative. December 2004 at 1 km spatial resolution was utilized. , analysis was focused on the growing seasons, i.e. and seasonal NDVI by station in the study area. station in the study area. 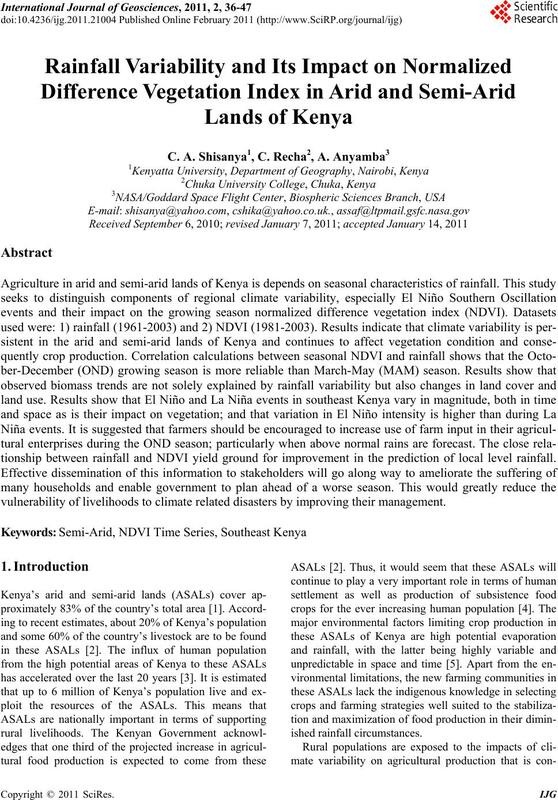 climatic events in Southeast Kenya. above normal rainfall especially during the OND season. dard deviation of above 1.0 during the OND season. ENSO events in some parts of Kenya. (b) Katumani (Machakos); (c) Kyuso (Mwingi). Note: Bold and unbold indicat e b e l ow and above rainfall e v e n t s , respectively. east Kenya vary in magnitude, both in time and space. tial impact of these events. 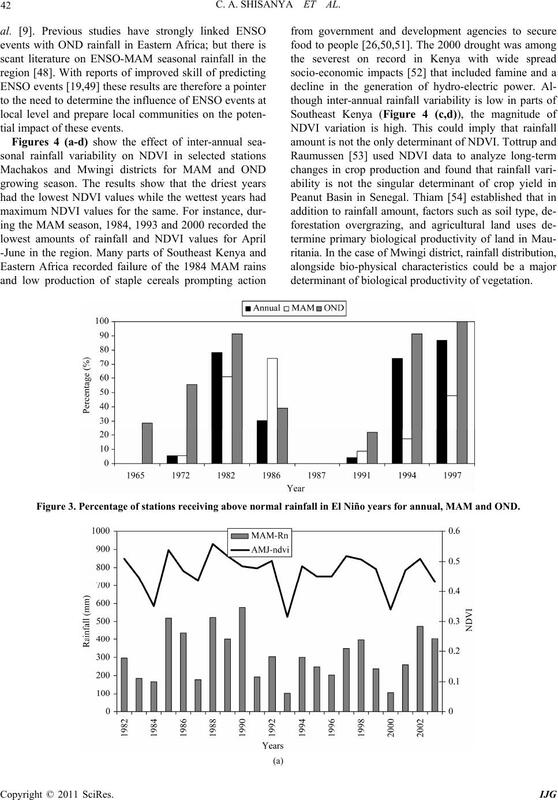 determinant of biological productivity of vegetation. Figure 3. 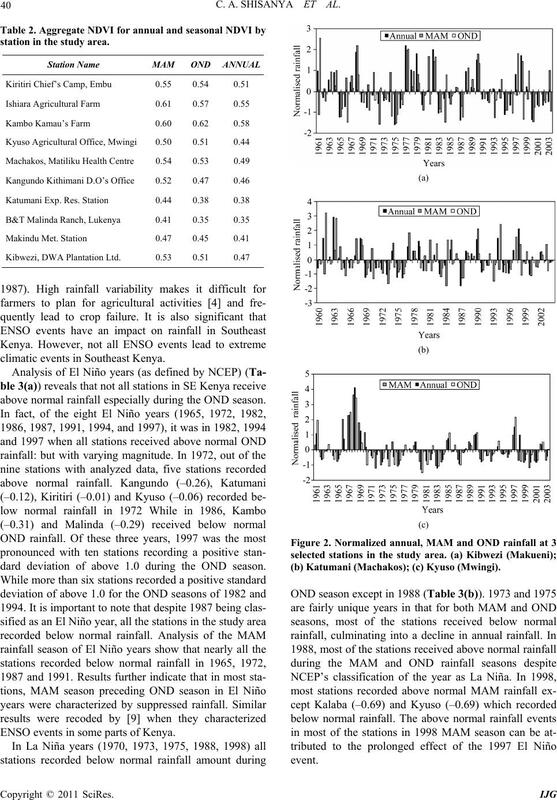 Percentage of stations receiving above normal r ainfall in El Niño years for annual, MAM and OND. tion has implications on the food web in the ecosystem. make early warning systems earlier. ing the OND season than for MAM season (Table 4). Southeast Kenya (a) Kambo-Embu, (b) Katumani-Machakos. does not always lead to an anomaly in southeast Kenya. African Global Change Research Community Programme. Ostafrika-Forsc-hung, Heft 14, Trier, 1996.
alien zur Ostafrika-Forschung, Heft 17, Trier, 1998.
rity, IRRI, Manila, Philippines, 1989, pp. 25-44.
lenges,” Agricultural Systems, Vol. 74, 2002, pp. 309-330. A. J. Challinov, J. M. Slingo, T. R. Wheeler, P. Q. Applied Meteorology, Vol. 42, No. 2, 2003, pp. 175-192. 2002, No. 15, pp. 1849-1860. 2002.
mate, Vol. 9, 1996, pp. 1043-1059. Vol. 8, 1988, pp. 34-43.
teorology, Vol. 128, No. 1-2, 2005, pp. 93-110. Forestry Meteorology, Vol. 42, 1988, pp. 295-305. Sub-Sa- haran Africa. Lynne Rienner, Boulder, 1986, pp. Physiological Processes,” Wiley/FAO, Rome, 1996, pp. 1999, No. 2, pp. 123- 142. No. 2, 1998, pp. 147-164.
ety B, Vol. 360, No. 10, 2005, pp. 2037-2047. P. J. M. Cooper, J. Dimes, K. P. C. Rao, B. Shapiro, B.
and Environment, Vol. 126, No. 1-2, 2008, pp. 24-35. Meteorology, Vol. 125, 2004, pp. 143-157. Arid Environments, Vol. 64, 2006, pp. 474-487.
pheric Scienc e,” Elsevier, Amsterdam, 1980, pp. 255-266. Warm Episodes by Season,” Internet available, 2005. No. 3, 2005, pp. 596- 614.
tion Magazine,” EMO Inc., Littleton, USA, 1994, pp. 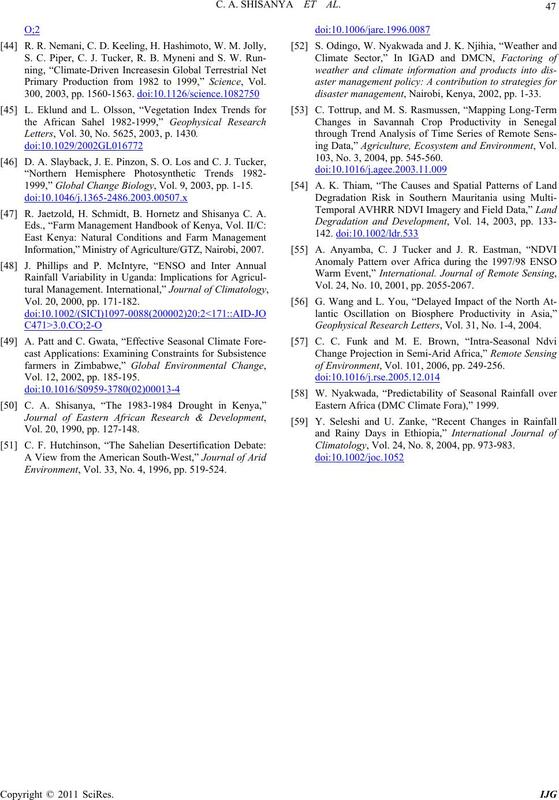 Journal of Climatology and Applied Meteorology, Vol. 23, No. 3, 1984, pp. 491-497. 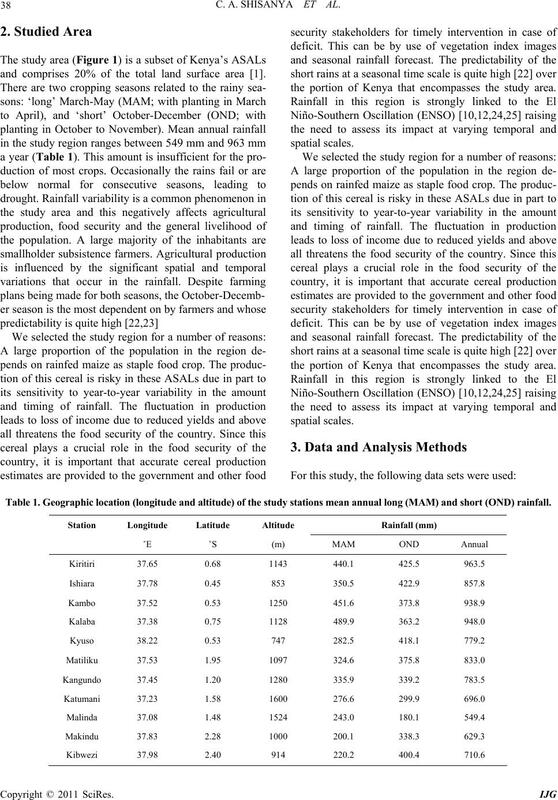 Corn Belt,” International Journal of Remote Sensing, Vol. 17, No. 16, 1996, pp. 3189-3200. No. 6, 1985, pp. 371-377. C. J. Tucker, B. N. Holben, J. H. Elgin and J. E.
Remote Sensing, Vol. 46, No. 5, 1985, pp. 657-666. Sensing, Vol. 7, No. 11, 1986, pp. 1435-1445. Change, Vol. 17, 1990, pp. 209-241. 1999, No. 7, pp. 587-591. No. 11, 1986, pp. 1583-1603. Remote Sensing, Vol. 12, No. 6, 1991, pp. 1405-1421. 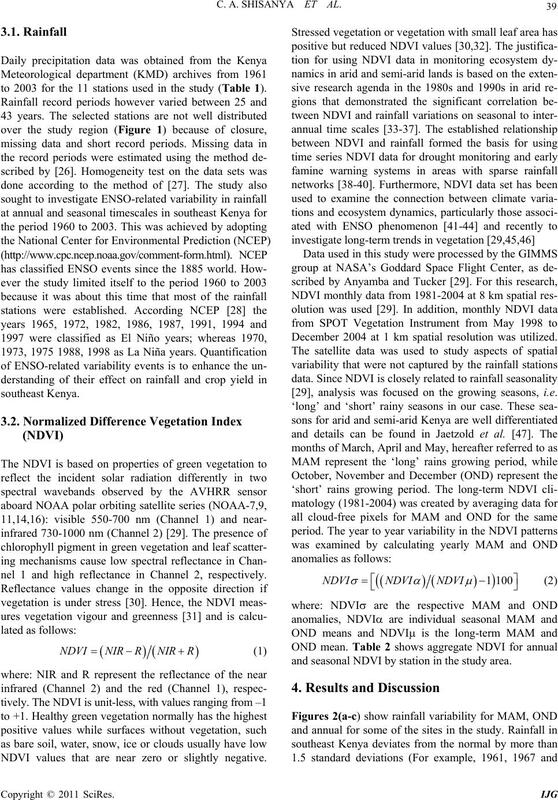 Journal Remote Sensing, Vol. 7, 1986, pp. 1583-1603. Sensing, Vol. 17, No. 13, 1996, pp. 2533-2548.
physical Research Letters, Vol. 23, 1996, pp. 729-732. 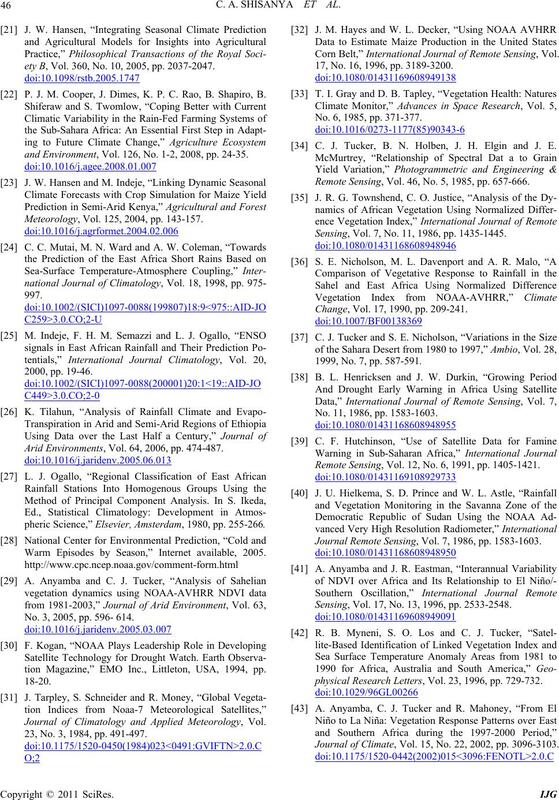 Journal of Climate, Vol. 15, No. 22, 2002, pp. 3096-3103. 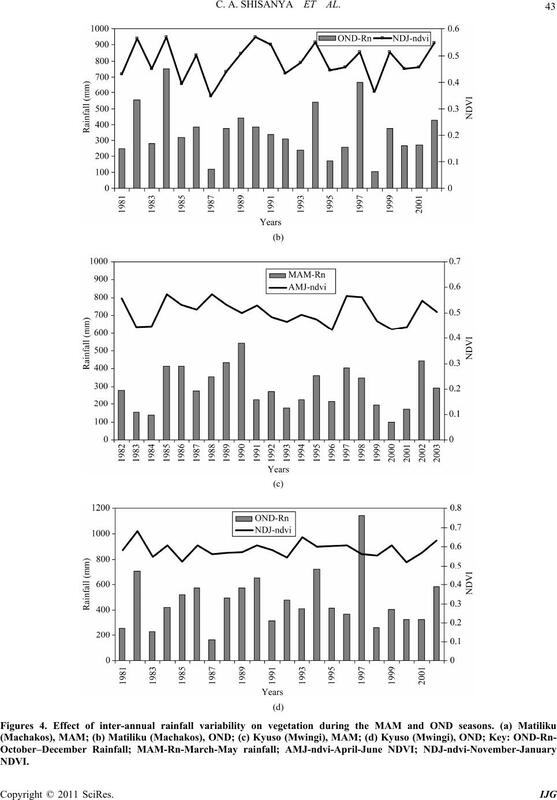 Primary Production from 1982 to 1999,” Science, Vol. Letters, Vol. 30, No. 5625, 2003, p. 1430. 1999,” Global Change Biology, Vol. 9, 2003, pp. 1-15. R. Jaetzold, H. Schmidt, B. Hornetz and Shisanya C. A.
Inf o r m a t i on, ” Mini str y o f Agri c u l t u r e / GTZ , N a irob i , 2007. Vol. 20, 2000, pp. 171-182. Vol. 12, 2002, pp. 185-195. Vol. 20, 1990, pp. 127-148. Environment, Vol. 33, No. 4, 1996, pp. 519-524.
disaster management, Nairobi, Kenya, 2002, pp. 1-33.
ing Data,” Agriculture, Ecosystem and Environment, Vol. 103, No. 3, 2004, pp. 545-560. Vol. 24, No. 10, 2001, pp. 2055-2067. 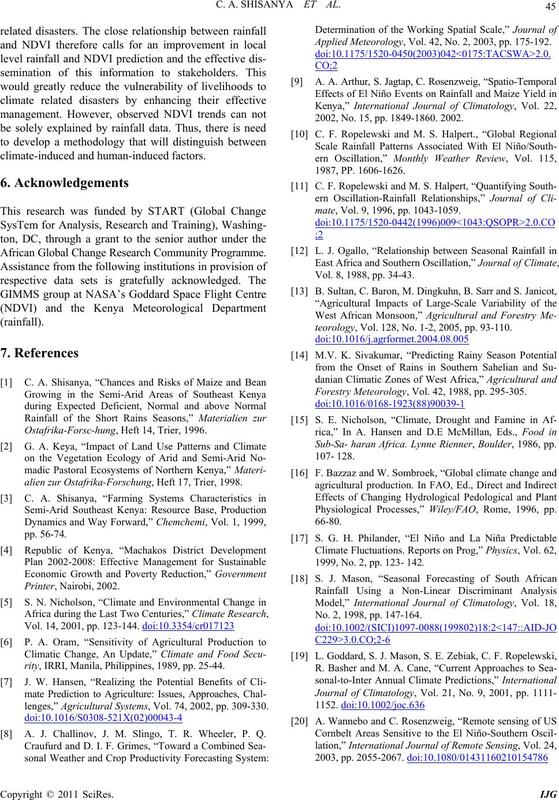 Geophysical Research Letters, Vol. 31, No. 1-4, 2004.
of Environment, Vol. 101, 2006, pp. 249-256. 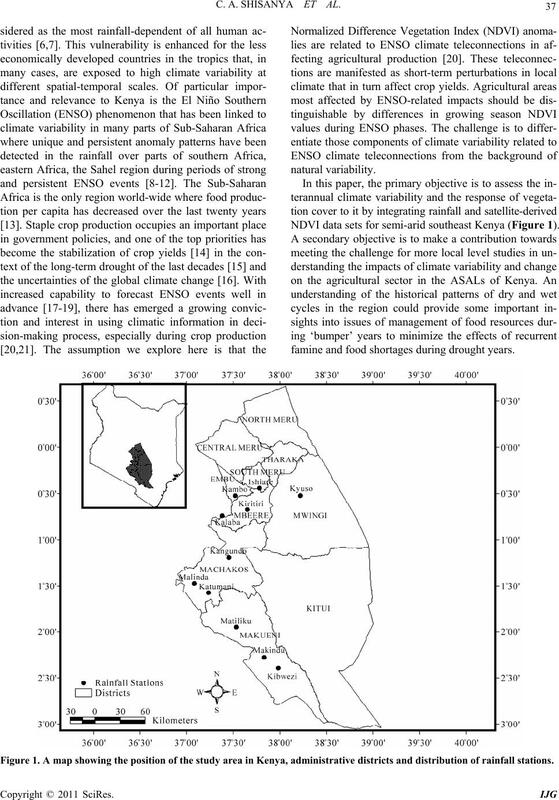 Eastern Africa (DMC Climate Fora),” 1999. Climatology, Vol. 24, No. 8, 2004, pp. 973-983.